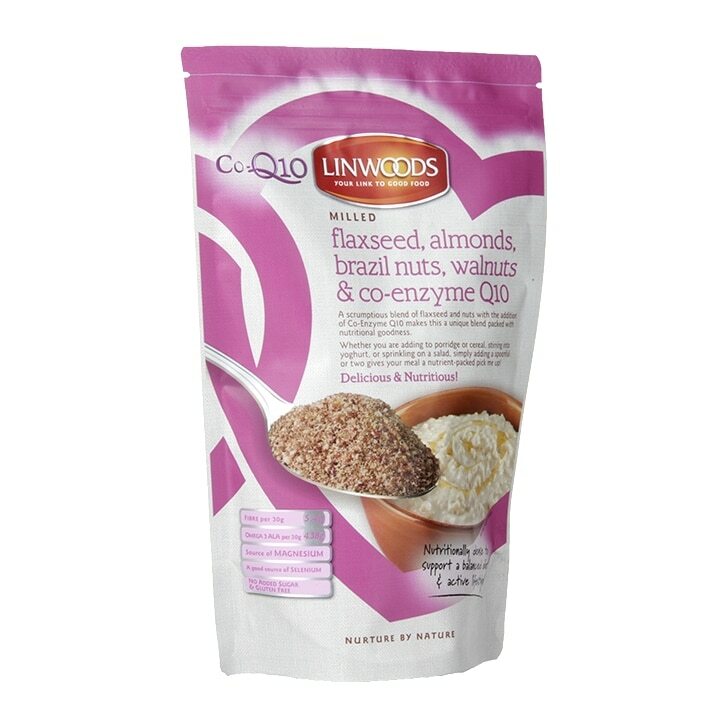 Linwoods Milled Flaxseed, Almonds, Brazil Nuts, Walnuts & Q10 is a great boost to your favourite meals. Co-Q10 occurs naturally in the body but natural production declines with age and so dietary sources are important to help maintain adequate levels. Linwoods healthy super foods are cold milled to aid quick and easy absorption into the body, so you can feel the immediate nutritional benefit in your diet, naturally. May contain traces of sesame seeds and soya. Linwoods Milled Flaxseed, Almonds, Brazil Nuts, Walnuts & Q10 is rated 4.9 out of 5 by 65. Rated 5 out of 5 by Anonymous from Excellent product I already knew the product, I had tasted it in Italy. I live in Finland and the only way to get it is through Holland and Barrett. The delivery was fast, the service is efficient and reliable. I'll order also in the future. Linwoods products are excellent! Rated 5 out of 5 by Jadeeeeeeee from Great for a balanced diet Great way of adding healthy things to your diet I wish I'd found this earlier also use other packs from the same brand. Rated 5 out of 5 by Estelle from tasty My recent purchase of flaxseed with walnuts, brazil nuts almonds and Q10 is just lovely with granola and natural yoghurt for breakfast, I shall definitely purchase it again. I have recommended it to my daughter by way of giving her a pack for herself. Great when on special offer too. Rated 5 out of 5 by Toby123 from Healthy & Tasty This is my first purchase from H&B. I think it's an easy way to get these items into my diet. I have a spoonful mixed into porridge. I ordered 3 packs to avoid paying postage, I'll do the same again. I gave one pack to a friend to try, she likes it as well! Rated 5 out of 5 by Sarjack from Tasty and healthy! We bought this as it’s a new part of our healthy eating diet. It goes with almost anything! It tastes lovely! I have mine with yoghurt, but you really can eat it with anything. Rated 5 out of 5 by Very satisfied customer from Excellent value for money I consider this to be excellent value for money . I consider it to be an essential part of my diet for good health .